Happy Wednesday!! I can’t believe that October is almost over. My favorite season is going by way too fast! 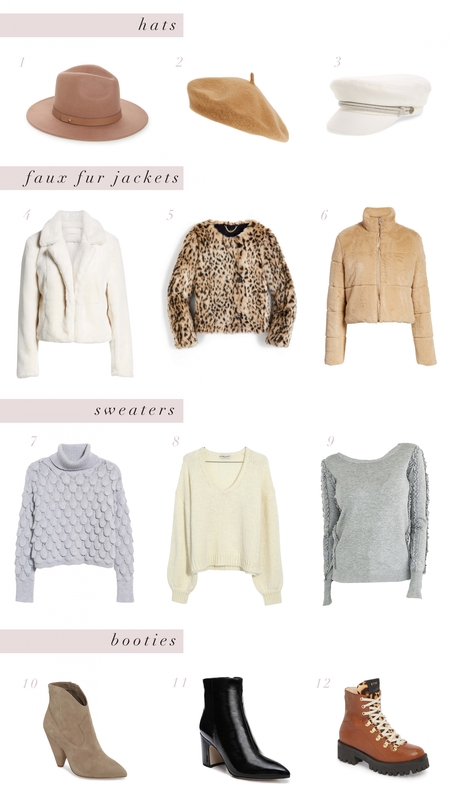 I’ve picked out a few essentials that are a must-have for any fall wardrobe. I love pairing a cute hat, faux fur jacket, sweater and boots for a easy yet stylish look. I wore these boots last week and got so many questions about them. They are actually on sale right so if you’ve been eyeing them now is the perfect time to add these chic fun boots to your closet. I’m all about berets and wool hats! So cute! I always adore and love the Beret, growing up in France that is all i Love Beret Beret Beret! ? Love the sweaters, so cute! These are great fall essentials. I especially like the jackets.